Last year, I finally managed to find the broker that is right for me, and charges me as little as $0.35 per stock transaction. The broker is Interactive Brokers. It is SIPC insured up to $500,000, and as an added bonus is publicly traded, which makes it easy to monitor its financials and ensure I have entrusted my money with a reputable organization. In addition, investor accounts are further insured up to $30 million dollars with certain underwrites at Lloyds of London. My review will focus only on investing in US stocks using Interactive Brokers (IB). However, they also offer direct investing in European, Asian, American and Australian markets at pretty low and competitive commissions. In addition, you can invest in futures, commodities, currencies, bonds, and options using their platform. I believe that most dividend investors mostly invest in stocks, while a small minority invest in options or bonds. Interactive Brokers also offers IRA accounts. 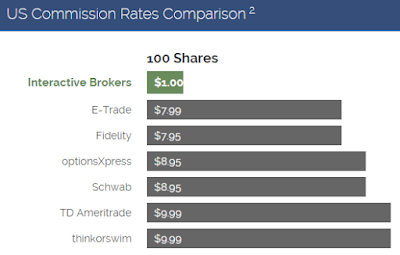 I am also not going to discuss that Interactive Brokers has the lowest margin rates available for retail investors. For someone with at least $100,000 in assets, the margin interest charged is 1.14% per year. The other brokers easily charge an interest rate of 6% - 8%/year for using margin. To open an account, you need $10,000. For some, this could be an obstacle. However, if you are under the age of 25, you can open an account with as little as $3,000. You can fund the account with cash or securities from your other broker. I moved some of my securities from an existing account to Interactive Brokers. Tradeking, Vanguard and Fidelity do not charge a partial ACAT fee when you transfer some of your securities to another broker. Opening an account includes the usual requirements such as Social Security Number, Address, Bank Account Information etc. The nice thing is that Interactive Brokers is also open for Non-US citizens. So if you are reading this site from Canada or UK for example, Interactive Brokers could be a good option that could dramatically lower your investment costs. There is a $10 monthly fee for investors, whose account value is less than $100,000. This fee is waived for the first three months after opening the account. If your account balance is less than $100,000, the monthly fee is reduced by the amount of commissions you generate. While $10/month seems like a lot, it is not that much when compared to what other brokers charge for one or two monthly investments. The $10 monthly charge amount is reduced by amount of commissions you pay. For example, if you pay $2 in commissions for the month, you only have to pay $8 more to get the $10 minimum. Since I am a buy and hold investor, I use delayed quotes, which are free. However, if I wanted to get streaming real time quotes, I would have to pay $10/month for it. If you are a dividend investor who makes a few investments per month, chances are that you do not need streaming real time quotes. 1) The first option to fund the account covers those who already have a brokerage account at an institution such as Fidelity, Vanguard, Tradeking that lets you transfer some of your existing shares over to another broker fee-free. An investor who has $100,000 in shares sitting in those other accounts can transfer them over to Interactive Brokers, and not have to pay any account transfer fee or the $10/monthly fee. And they will get to enjoy ridiculously low commissions forever. This includes my experience, as I had been building up my dividend portfolio for the preceding 6 - 7 years. I moved a large portion of my shares held at Tradeking over to Interactive Brokers last year. 4) If I didn’t have $10,000 and I were over the age of 25, I will not be able to open an account with Interactive Brokers. I will need to save that amount, before opening an account with IB. I would start an account with Loyal3, or Tradeking or another broker, and as I gain a sufficient amount of assets, I would transfer them out fully or partially to Interactive Brokers. Based on my interactions with readers, those that have never had a brokerage account find IB interface to be a little confusing. So based on that, I would not open an account with IB, if that is the first brokerage account ever. I personally do not find that interface to be incredibly complex. However, I have used different types of brokers of the years to know how to familiarize myself with different layouts. 5) Update Feb 2017: Astute reader Joe notified me that Interactive Brokers has eliminated the $7.50 quarterly fee for IRA accounts. As a result, I would think that Interactive is a great option for someone rolling over a 401 (k) into an IRA, or for someone with a six figure IRA. Interactive Brokers offers IRA accounts – Roth, SEP, Regular, and no longer has a $7.50/quarterly fee payable to the trustee. For a new IRA account, it could easily take a decade or more, before the account reaches $100,000. During that time, it would incur the $10/monthly fee, that is reduced by any commissions you pay. Of course, if your IRA is in the 6 figures, might be worth switching over to Interactive Brokers. Moving to Interactive Brokers for long-term dividend investors will result in a much much lower annual cost than even the lowest cost index fund out there. To some this will sound like too much hoops to jump through. Once you familiarize yourself with the pricing, it seems pretty straightforward however. To others like me, this looks complicated only on the surface – in reality this is the cheapest alternative out there for experienced dividend investors. Interactive Brokers provides direct access to the stock market, and super low commissions, for a service I would be using anyways ( though the same service would be much more expensive at another broker). Therefore, one of the errors I had made for a few years after Zecco stopped offering free trades is pay $4 - $9 more per trade than I have to. I like cutting costs, without incurring any additional effort on my part after the switch. With Interactive, I have cut costs to trade without any additional effort and without really changing the way I invest. I like the fact that everything about Interactive Brokers is very transparent. They offer a lot of bells and whistles, which cost a little more. As a passive dividend investor for example, I do not really need streaming quotes. I do like the fact that I only pay about 1% on margin, which is much lower than any other brokers.